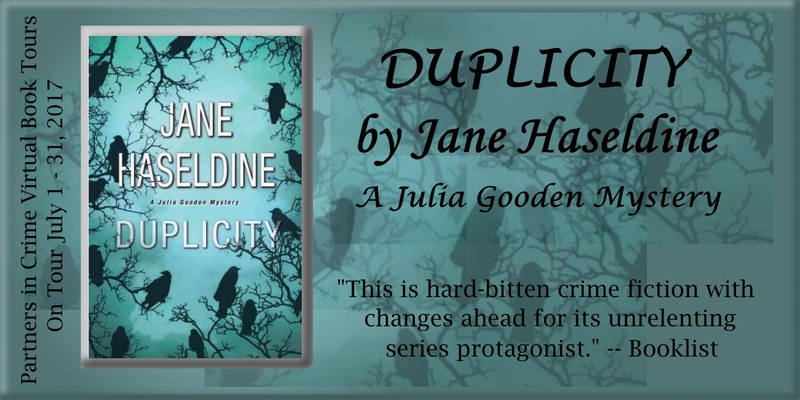 Duplicity is the second book in the Julia Gooden mystery series following a crime reporter in the city of Detroit (like the main character, Julia, I am a journalist and former crime reporter). Julia is still haunted by a painful tragedy in her past. Her brother was abducted when they were children, and thirty years later, his case remains unsolved and is the reason Julia became a reporter, to give others the closure she could never find for herself. 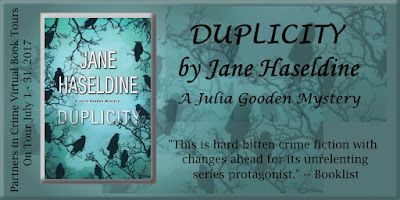 In Duplicity, Julia is up against her own past demons and the city’s most ruthless criminal. Julia’s husband, assistant district attorney, David Tanner, is first chair for the trial of Detroit’s notorious crime boss, Nick Rossi. On the first day of the trial, a bomb goes off on the courthouse stairs, killing the prosecution’s key witness, Rossi’s second-in-command who was set to testify against his former boss, and critically injuring Julia’s husband. Now the story for Julia becomes personal. She enlists the help of her best source on her beat, Detroit Detective Ray Navarro, and the two work to piece together evidence that will connect Rossi to the attack. But the digger she deeps, Julia begins to unravel a tangled web of corruption, political ambition and blackmail and none of the players are whom they seem to be. When the lives of Julia’s children are threatened, Julia puts everything on the line to seek justice for the innocent and risks her own life to ensure her family is safe. I write mysteries. I got completely hooked on them when I was a kid. My mother took my siblings and me to the public library every Saturday growing up. When I was eleven, I had read every single book in the children’s section, and I told my mom I wasn’t going to go to the library anymore, because I thought I was too cool. That day, my mother checked out And Then There Were None by Agatha Christie for me. It was like I discovered fire, and I’ve been smitten with mysteries every since. Stephen King is my absolute favorite. His stories, even if I read them twenty years earlier, have always stayed with me. In the mystery genre, I’m also a big fan of Robert Crais, Dennis Lehane, Linwood Barclay, John Sandford and Michael Connelly. I’m currently reading Broken Monsters by Lauren Beukes, and it’s terrific. Stick with it! Write and read every day. And be persistent despite rejections. 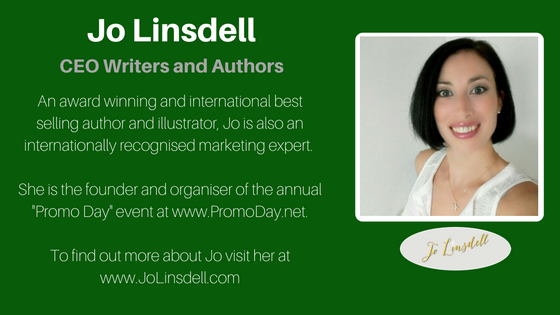 It took me more than six months and sixty rejections to finally land a literary agent, and six more months after that to land a book deal with a publishing house. 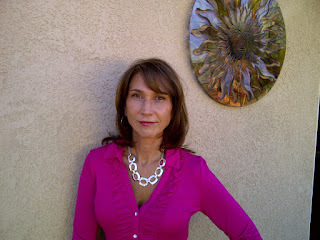 I believe, as a writer, its imperative to never, ever give up. My favorite character in the book is its strong, yet flawed lead, Julia Gooden. Booklist’s review of Duplicity calls Julia, “ferociously bold and persistent.” Because of what happened to her brother, Julia is a dogged reporter who will stop at nothing to get to the truth. She is a good mom, an ethical, yet driven reporter, a loyal sister who never gave up on finding out what happened to her brother, and she is fearless when it comes to keeping her children safe. I think she’d be a very loyal friend, and if I were ever in a fight, I’d want Julia to have my back! 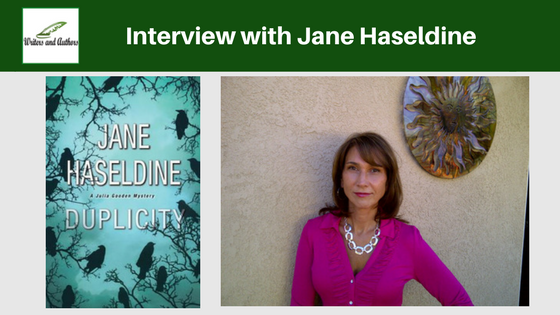 When I started writing Duplicity, I had h a clear idea of who the bad guy would be. But the story took me in another direction, and I followed its lead. I hope the result, and not going along with my first instincts, will wind up being a real surprise to the readers. What I discovered in writing this book is that I may have a concrete plan in place, but I should allow myself the creative freedom to deviate, even substantially, if the story guides me elsewhere. Like my main character, Julia Gooden, I’m a journalist and former crime reporter. Although I know my way around a crime scene and can infuse my experience as a journalist into my stories, I’m not a police officer. For Duplicity, I reached out to a few former sources, both of who are retired police detectives, for background. 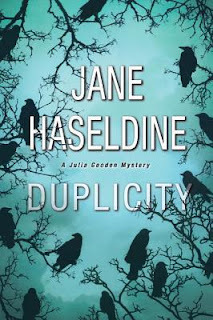 Duplicity is not a police procedural, but I needed to make sure the story is believable and my former sources were a great help. The third book in the series, Worth Killing For, will be released by Kensington Publishing in April 2018. I’m currently wrapping up the fourth book in the series, Strange Magic. Having read this book, and loved it, I'm glad to see that there is another one in the making!